Note: You should only turn on one of these layers at a time or they may interfere. 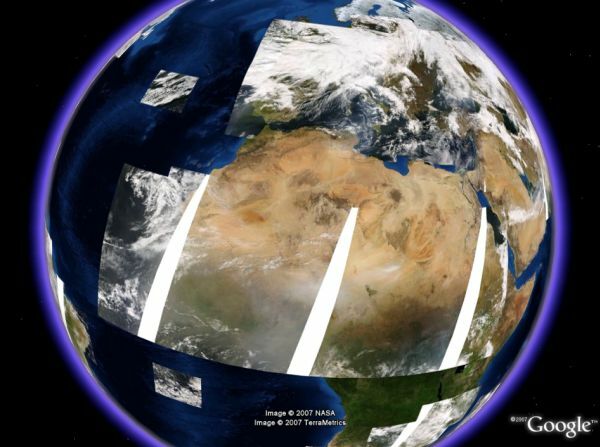 Implementing transparency on the blank spots in the MODIS satellite would allow the rest of the Earth to show through. He also shows an example of what this would look like with a Blue Marble underlayed with the MODIS data. These links are definitely network links worth saving in your "My Places". These are powerful examples of how GE can be used to show large dataset updated frequently and more useful as you zoom in closer. Not only that, but this is yet another step towards near real-time satellite photography being made available for GE. This is the kind of work I would expect the new NASA/Google relationship to produce. Once again, another fabulous overlay done first by EarthBrowser 2 years ago. comes with the terra and aqua daily updates, a global infra-red image, historic terra and aqua images of various disasters, cloud formations, fires and dust storms (you could spend hours playing with this feature alone! ), one meter resolution ortho mapping of the US, USGS mapping of cities ( Landsat 7 infra-red band 1, and US navy cloud-top imagery... all in one file! This IS a must have for 'My Places'. oh yeah, but these new ones show more detail as you zoom in! AWESOME!! If you go to http://onearth.jpl.nasa.gov/ there's a link to the WMS server, http://wms.jpl.nasa.gov/wms.cgi You can use this directly in GE as the source for an image overlay which gives a variety of layers to choose from.